Two men ready their weapons. An excited crowd of Romans cheer loudly in anticipation. Both combatants realize full well that this day might be their last. They are gladiators, men who fight to the death for the enjoyment of others. As the two gladiators circle each other, each knows that his objective is to maim or trap his opponent rather than to kill him quickly. What's more, the fight must last long enough to please the crowd. The gladiators jab swords and swing maces. They sweat in the hot sun. Sand and dirt fly. Suddenly, one gladiator traps the other with a net and poises to kill him with a three-pronged trident. The victor waits for a sign from the crowd. If the losing gladiator has put up a good fight, the crowd might choose to spare his life — and the vanquished gladiator will live to fight another day. But if the crowd is dissatisfied with the losing fighter — as was usually the case — its dissatisfaction meant slaughter. In ancient Rome, death had become a form of entertainment. Before fighting, gladiators had to swear the following oath: "I will endure to be burned, to be bound, to be beaten, and to be killed by the sword." Over time, the games became more spectacular and elaborate as emperors felt compelled to outdo the previous year's competitons. The games involved more participants, occurred more frequently, and became more expensive and more outlandish. In Rome, the gladiatorial contests were held in the Coliseum, a huge stadium that first opened in 80 C.E. 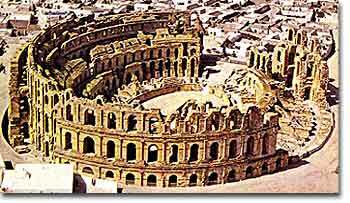 Located in the middle of the city, the Coliseum was circular in shape with three levels of arches around the outside. In height, the Coliseum was as tall as a modern 12-story building; it held 50,000 spectators. Like many modern professional sports stadiums, the Coliseum had box seats for the wealthy and powerful. The upper level was reserved for the commoners. Under the floor of the Coliseum was a labyrinth of rooms, hallways, and cages where weapons were stored and animals and gladiators waited for their turn to perform. The Coliseum was also watertight and could be flooded to hold naval battles. Special drains allowed water to be pumped in and released. But, naval battles were rarely held there because the water caused serious damage to the basic structure of the Coliseum. The Coliseum wasn't the only amphitheater in ancient Rome; there were several scattered throughout the entire empire. The amphitheater pictured above is in Tunisia, Africa. 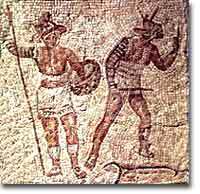 The gladiators themselves were usually slaves, criminals, or prisoners of war. Occasionally, the gladiators were able to fight for their freedom. Criminals who were sentenced to death were sometimes thrown into the arena unarmed to serve their sentence. Some people, including women, actually volunteered to be gladiators. They were willing to risk death for the possibility of fame and glory. Many gladiators went to special schools that trained them how to fight. A few gladiators boxed. They used metal gloves to increase cutting and bleeding. Some gladiatorial contests included animals such as bears, rhinos, tigers, elephants, and giraffes. Most often, hungry animals fought other hungry animals. But sometimes hungry animals fought against gladiators in contests called venationes ("wild beast hunts"). On rare occasions, the animals were allowed to maul and eat a live human who was tied to a stake. This relief sculpture from the 2nd century C.E. illustrates what a chariot race in the Circus Maximus might have looked like. The competitors completed seven intense laps in front of a crowd of 300,000. Romans loved chariot races, which were held on special racetracks called circuses. The most famous circus, which was in Rome, was the Circus Maximus. In chariot races, two- or four-horse chariots ran seven laps totaling anywhere from three to five miles. 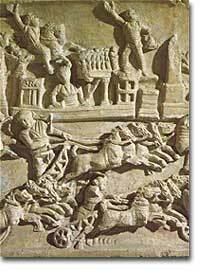 Roman games included other type of equestrian events. Some races with horses and riders resemble today's thoroughbred horseracing. In one type of race, riders began the competition on horseback but later dismounted and ran on foot to the finish. As the Roman Empire started its decline, the author Juvenal (55-127 C.E.) noted, "The people are only anxious for two things: bread and circuses." A gladiator's a gladiator, right? Wrong! A gladiator could specialize as a thracian, secutor, retiarius, or bestiarius; each category of gladiator had its own unique armor, weapons, and fighting style. This webpage, done by a college professor, points out the differences among the different types of gladiators and describes their weapons and armor in great detail. Be sure to click on the underlined words and phrases in the text for extra images. The Roman arenas weren't used only for gladiatorial combats and chariot races. Sometimes, people sentenced to an agonizing public death were thrown into the amphitheater to be killed by wild animals. Christians were often the victims of this terrible fate. The polytheistic Romans had a hard time understanding the monotheistic nature of Christianity, and often persecuted the followers of the Christian faith. 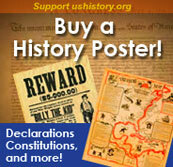 Read more about the history of Christian persecution from the time of Nero in 64 C.E. to Constantine's reign in the 4th century C.E. This comprehensive website contains information on just about every aspect of Roman life. From travel to technology, and from farming to famous people, this site has it covered. Great illustrations and fabulous photographs accompany each article. Chariot racing was extremely dangerous, and drivers were often severely or even fatally injured. Read more about the races in this article on Roman entertainment, which also discusses gladiatorial combats, theater, and music. Built in the 6th century B.C.E., the Circus Maximus could seat as many as 300,000 spectators and was used primarily for chariot racing. It experienced its share of disasters during the 1,000 years it was in use — it was destroyed by fire twice, and on a few occasions the stands collapsed and killed many people in the audience. This brief but informative webpage offers some interesting facts about one of the most famous amphitheaters in the Roman Empire. The Ludi, or public games, were a source of entertainment for ancient Romans. From the drama of theater plays to the brutality of gladiatorial combat, the Ludi grew in popularity until it was said that the Roman people sought only two things: "bread and circus." An Exceptional Roman Website for Videos, information, images, games, quizzes and facts on Roman life.